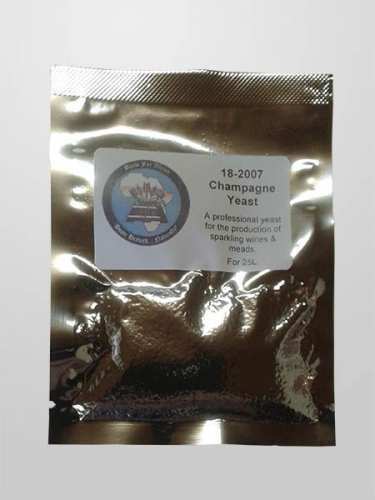 Although our primary focus is the brewing of beer, we also stock a growing range of ingredients for the amateur wine make, distiller, mead or cider maker. However, while making these beverages is fun and not all that difficult, please make sure you know how to use these products before you buy them. Good websites to get you started are Tony Ackland's Home Distillation website and the Grapestompers Tutorials. 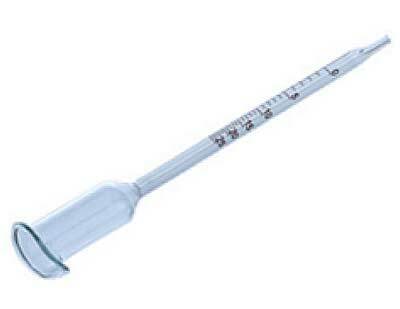 This alcoholometer is a hydrometer calibrated for distilled spirits. It has a Gay Lussac type scale, i.e. it directly indicates the alcohol percentage by volume. Note that this alcoholometer is only intended to measure the alcohol content of a pure distillate (i.e. an alcohol/water mixture) and is not suitable for measuring the alcohol content in wine, beer, liqueurs and other beverages containing other ingredients such as sugars, thickeners, emulsifiers etc. Scale 0-100% ABV. Calibrated at 20 degrees Celcius. 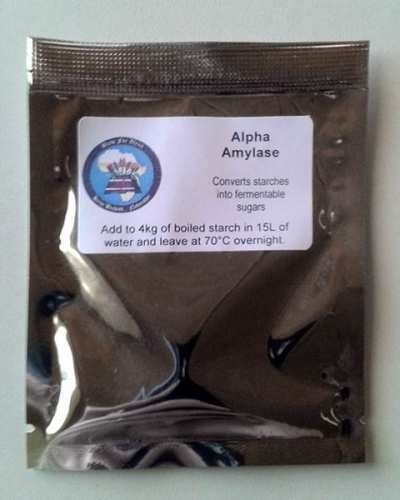 Alpha amylase is an enzyme used to convert starches into fermentable sugars. Malted barley and wheat contain this enzyme naturally, but all other sources of starches (e.g. maize, unmalted grains, starchy vegetables, etc.) need to have their starches converted into sugars through the addition of amylase. Note that most vegetable starches (other than those derived from malted barley and wheat) have to be cooked first in order to make them water-soluble before the enzyme can work on them. Boil 4kg of starch in 15 litres of water for at least half an hour, then cool to 70°C, add the enzyme, and keep at 70°C overnight. Do not exceed 72°C. Use an iodine test to ensure that the saccharificatio is complete before transferring the wash to the still. This apple cider is produced from only South African ingredients. 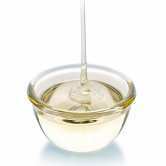 Its main component is pure apple juice concentrate. 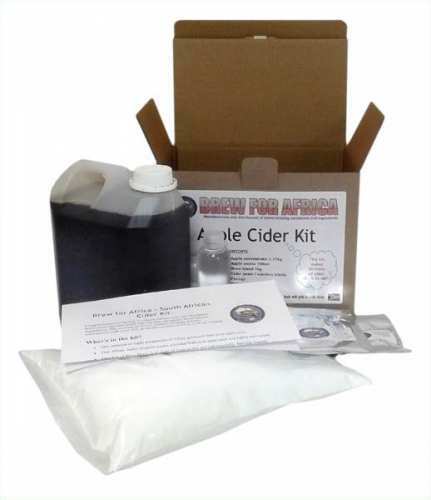 It will produce a cider that is on par with any commercially produced craft cider, and comes complete with apple aroma, brew blend, yeast & yeast nutrient and beer finings (not included are cleaning and sterilizing powders, carbonation drops and crown seals). Makes 20 liters of cider at 5 to 5.5% ABV. 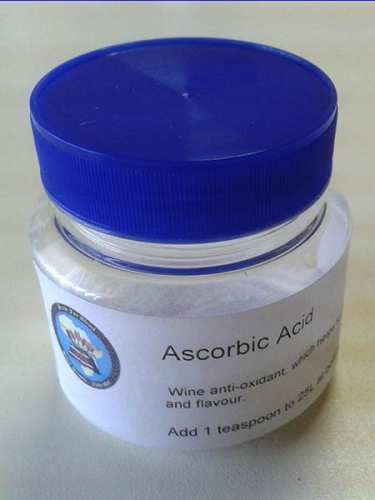 Ascorbic acid is a common anti-oxidant used in wines. It helps to preserve the wine's colour and flavour by preventing oxidation (which could lead to browning and spoilage). 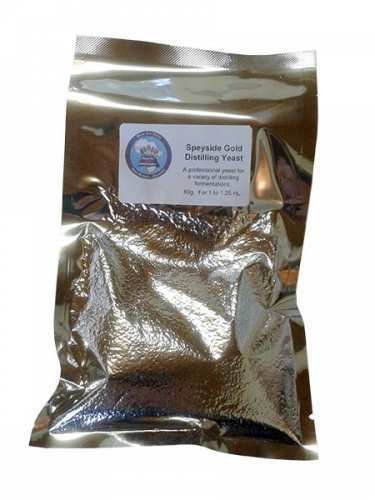 It is highly recommended for wines that discolor easily, such as apple or pear wines. It is also recommended for white wines where a slight discoloration can be easily detected. Dosage: stir one teaspoon into 25 litres of wine just before bottling. An effective clarifier for crystal-clear wines. 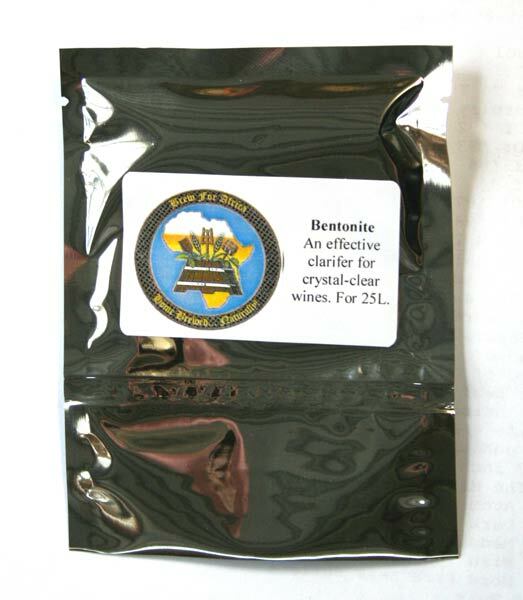 Rehydrate dry bentonite by vigorously mixing it with just enough warm water (about 60°C) to create a slurry. Mix until smooth. Let sit in an airtight container (to prevent drying out) for at least 4 hours, then stir the slurry vigorously into the wine but do not splash (so as not to introduce oxygen into the wine) and allow 7 days for the wine to clarify. For 20-25 litres. Campden tablets are used as a sterilizing agent. May also be used for sterilizing and stabilizing wine. Use 1-2 tablets per 5 litres. Some liqueurs require the addition of liquid glucose to add sweetness, body and mouth feel. Specific gravity: 1.33. Improves the extraction of colour and aroma from grapes and other fruits in white and red wines.. For 25 litres of must. 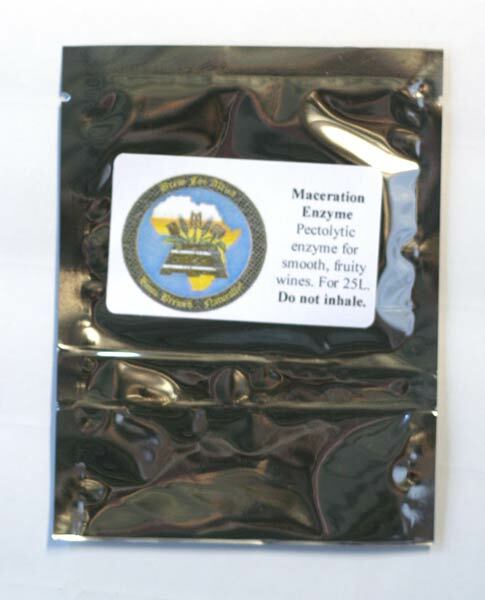 Warning: may cause allergic respiratory reactions or asthmatic symptoms if inhaled. Add to must immediately after crushing the fruit and leave for at least 24 hours. 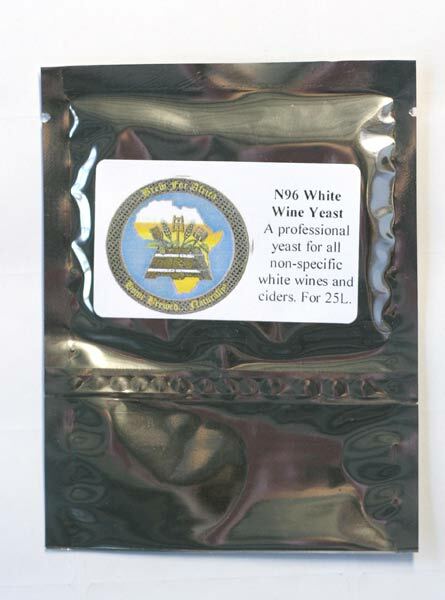 A professional white wine yeast for all types of white grapes and other light coloured fruits. 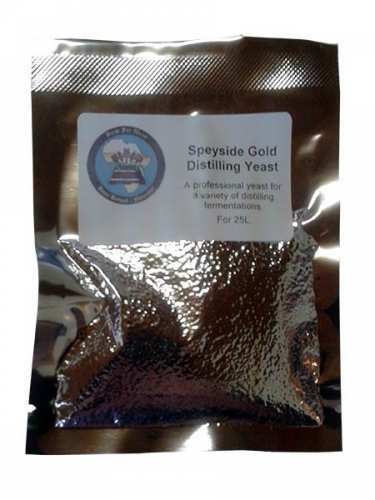 This is a non-specific, neutral yeast, i.e. not tailored for just a single grape cultivar such as Chenin Blanc, Chardonnay, Sauvignon Blanc, etc. but instead will produce wine flavours driven by the fruit. Medium-sweet flavour profile. Excellently suited for making fruit wines, ciders and even sweet meads. Fermentation temperature range: 12-28°C. Alcohol tolerance: 16.5% ABV. For 25 litres of must. Use in combination with a good yeast nutrient is recommended. 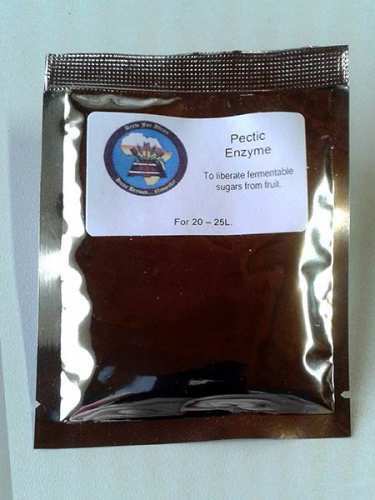 Pectic enzyme, also known as pectinase, breaks down the pectin in fruits, which in turn liberates the fermentable sugars and reduces "pectic haze" in wines. For 20-25L of must. 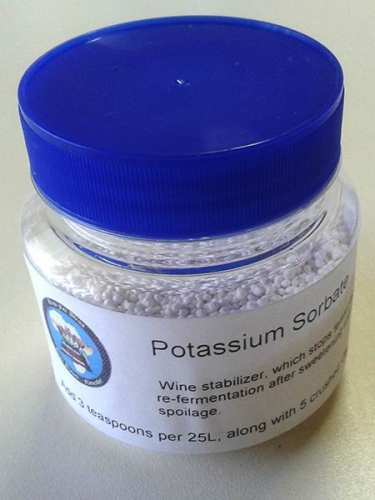 Potassium sorbate is a common wine stabilizer. 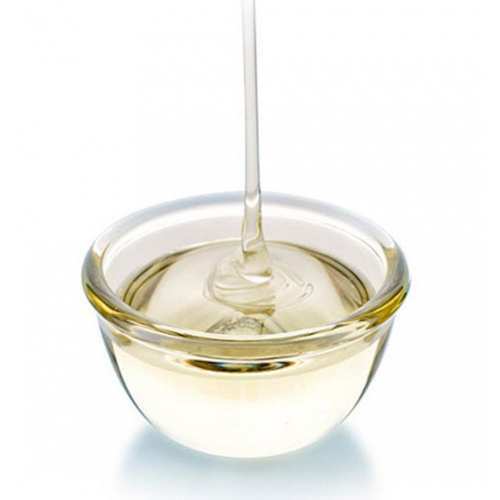 It is added to wines to stop the fermentation, to prevent microbial spoilage and to prevent further fermentation of sugars added after fermentation (e.g. when you back sweeten a wine). It should be used in conjunction with Campden tablets. Dosage: add 3 teaspoons along with 5 crushed Campden tablets to 25 litres of wine. Determines the alcohol percentage by volume in wines. Not suitable for beer or distilled spirits. 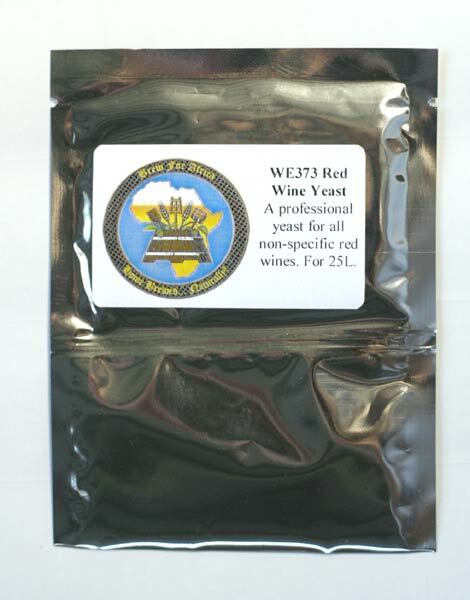 A professional red wine yeast for all types of red fruits, e.g. red wine grapes, cherries, berries, raspberries, dark plums etc.. This is a non-specific.yeast, i.e. not tailored for just a single grape cultivar such as Merlot, Bordeaux, Cabernet etc. but instead will produce wine flavours driven by the fruit. For 25 litres of must. Use in combination with a good yeast nutrient is recommended. 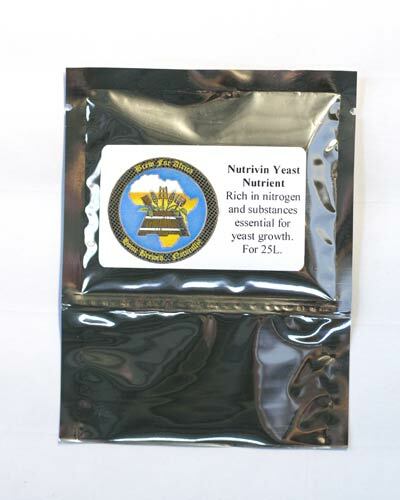 A professional yeast nutrient rich in nitrogen and other elements essential to yeast growth and a good fermentation. For 25 litres of must or sugar wash.